It’s Memorial Day weekend and you and the hubs are tired of looking at four walls. The baby is sleeping but will soon be awake, and the three-year-old needs to burn off some energy. Where can your family have fun without breaking your toddler’s piggy bank? What’s going on in SoIN that’s family-friendly? Abbey Road on the River. What’s that, you ask? 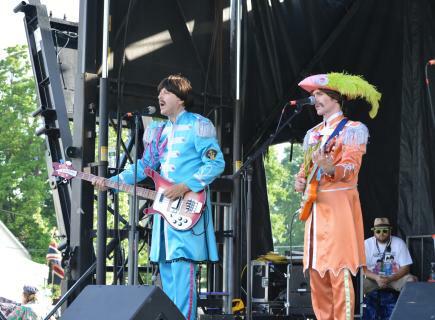 It’s the Beatles-inspired music fest held in Jeffersonville’s Big Four Station Park, May 24-28. 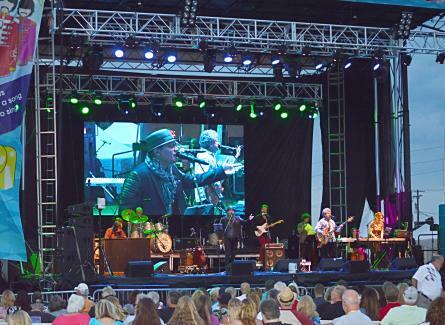 Attracting visitors and bands from across the world, ‘60s and ‘70s music takes center stage (there are four stages, actually) for five days. Sure, Abbey Road on the River attracts people who grew up during that era. People your parents or grandparents age will be singing along and dancing. But you’ll also see families lounging on blankets eating lunch, children playing on the playground—parents and children of all ages enjoying music and time together. What makes the downtown park so appealing and family-friendly? Big Four Station Park has paved walkways—clean and safe paths throughout the park, just the right width for strollers. Encompassing an two city blocks, there’s plenty of plush lawn to go around. At night, the park is well-lit and protected. 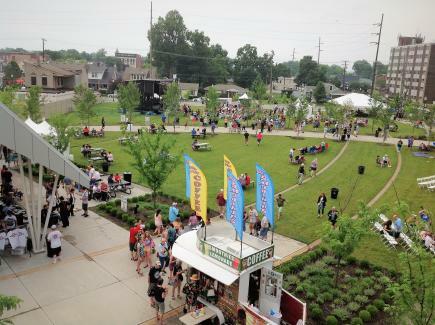 There will also be food vendors onsite, adding convenience to your fun day. No need to pack and carry food around! 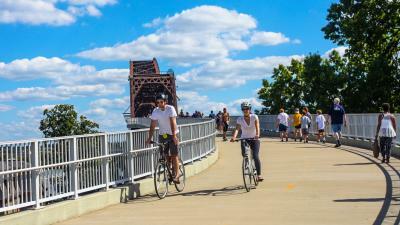 The bridge spans across the Ohio River to Louisville, KY, providing cool breezes and cool views. It’s a mile long—two miles total if you walk to the end and back. Older children can brag that they’ve walked to two states in one day! What really makes this festival family-friendly is the music itself. Younger generations may be introduced to the Beatles for the first time. Hearing lyrics that encourage peace and love are priceless. You’ll hear other bands’ music, too, not just Beatles’ hits. Who knows, you may be re-introduced to favorites you listened to as a kid! And, last but not least, the cost is very family-friendly. 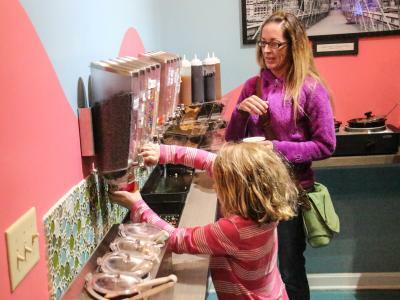 Adults pay $20 for a one-day general admission ticket, which includes a FREE under 21 admission. * For an entire day of live music, picnicking, playing, strolling, walking, biking, and enjoying some much-needed family time, you can’t beat that. Want to know what bands are playing? Visit AROTR.com for the complete line-up and performance schedule. * Regular price is $35. Save $15 by using WAVE3NEWS discount code through May 23. Tickets can be purchased online or at the SoIN Visitor Center, 305 Southern Indiana Ave., Jeffersonville.